"Great tool for phone interviews!" I like how easy it was to categorize my call transcripts. I also appreciate how I can go back and load previous categories on new transcript. This software goes the extra mile in offering a complex working environment while also eliminating the hassle of most complex software. I have used multiple transcription softwares before for text analysis and NLP; NVivo tops them all in creating value for your team. I do not like how difficult it is to work on the same document or transcript with team members. I think that there should be more options for editing a file, similar to having the ability to redline a document in a word document. Although this many not be an option, I found it very difficult to view my working file on other devices. I wish that NVivo had a PDF option where I could view-only. I think that with this view-only option, the software would still be able to maintain the exclusivity of a pay for software. Take the time to learn all of the features to Nvivo by watching the tutorials - it will pay off! We needed a reliable software to preform qualitative text analysis. The complexity and features of the software have created great value for our team. "Useful tool for qualitative research "
It keeps the coding process less messy than what I would do in pen and paper/excel files. I also like that feature that allows me to see the codes in one place. It appears that the software uses a lot of spaces and power on the laptop, which creates a lot of heat. When conducting data analysis, I tend to open other files (i.e., word documents). It could be because of that, but my computer sometimes shut off all of sudden. I would appreciate if a little bit less expensive options, especially for graduate students. They need to start learning these softwares to be ready for research projects, but it's not easy for them to buy the license unless they get research funding. Currently, the Dedoose (spelling) appears to be the common software to use among grad students, due to the low price, and lower requirement for making commitment on the software. Unless we know for sure that we want to keep using the software for a long time, 600-700 is not an easy amount of money for people to pay. I can send the NVivo file to my collaborators. The easiness to share the analysis as well as the ability to incorporate pictures and video into analysis are the strength of NVivo. At the same time, it sometimes limits the users and easiness to share because of the price... not everyone can afford the software at their own expenses. "Overall positive and useful software"
The programme is intuitive and easy to learn. I used it for my MSc thesis, and found it a useful tool to identify and group important data points, and collaborate on my research with my professor. Qualitative analysis of large texts can be a challenge, and this really helped to streamline the whole process. It was quick and easy to assign a data point to a node, and this could then be reviewed either as a part of the whole text, or alongside other data points within that cluster. It could be frustratingly slow at times with lots of lag, especially when scrolling through a large text. The search function likewise ran slowly, to the point where I sometimes would not use it. This is a very useful product, especially if you are doing textual analysis or qualitative analysis of any kind of written discourse. Being able to select data points thematically and group them together allows you to see patterns you might miss. N/A, I used it for academic purposes and do not currently work for a company that uses NVivo. "Limited experience but fairly easy to use"
I really liked the ease of access to basic data entry and interpretation. I enjoy the design of the product - a simple, mid-2000s interface that runs smoothly and does not have unnecessary bells and whistles. Also, it offers user-interface programming! Due to limited experience, there were so many components it seemed a little overwhelming. The product is still very new, and there will always be upgrades ready to be made. I did have multiple instances with the product crashing although it could have been computer related. I would definitely recommend watching video tutorials or reading websites that might have tutorials, instructions, or tips on how to navigate and use NVivo. I can only compare it to Atlas.ti, but I would prefer to use NVivo over Atlas.ti if I were to use it in a business setting. I hope that the company makes strides sooner rather than later to rise to the top of the qualitative analysis applications. I have only used NVivo in a classroom setting, but it seemed to have many potential benefits for business. I thoroughly enjoyed being able to export and import data to Microsoft Excel AND SPSS. "Ethnic identity publication project "
The best thing about NVivo is the ability to collaborate across organizations and research groups, in order to compare and contrast notes and findings. Until recently, NVivo lacked the interface to allow at a glance coding placement on screen in an easily accessible place. While other products have had these capabilities for some time now, NVivo figured out how to integrate these capabilities into its unique approach to qualitative data analysis. These features are quite helpful in the ability to toggle back and forth between coding, parsing the data into topical subject areas and cross referencing. Data analysis is enhanced through the ability to view coded topics in various formats, and this feature contributes to the strength of analysis. Any good researcher will evaluate tools and processes necessary to the project. Among the research tools considered, NVivo can be particularly helpful with small business users, and the software is widely used in government, education and not for profit research. Real world researchers in NGO or not for profit settings generally lack funding to purchase new software for each project. The ability to collaborate across organizations and pool staffing resources without incurring new expenses makes researching and publishing easier. "A bit Confusing, but worth it When you pass the learning curve"
What I like about Nvivo is the various options you have to import different data types. It is very handy when it comes to handling and analysis qualitative data, most especially text. Another interesting feature on Nvivo is the data visualisation options such as word clouds and word trees. They help when trying to summarise and give a general picture about a large amount of text. I use Nvivo for analysing my research data. I also use it to analyse responses I get from my students during one to one sessions when they write a summary of their feedback at the end of sessions. "NVivo, fantastic tool for the organization of any project." Currently in the field where I work job is handled a lot of information, which is essential to keep these data organized, I have been able to achieve thanks to NVivo. This tool has allowed me not only to organize, but also to analyze the texts regardless of the format that comes from, editing texts for the construction of reports, among others. NVivo turns out to be a little complicated at first because it has a lot of functionalities which has cost me to adapt, but every day I discover a little more about this wonderful tool. Indeed this application meets all my expectations, it has a very friendly graphical environment, and as I use it I discover new things about it. It is an application that is worth discovering and implementing. This application has allowed us to visualize graphically a lot of information and that was of great importance for the teamwork, but most important the organization of the data for a thorough analysis and for the creation of reports. "NVivo for nutrition policy research "
NVivo makes it easy to code transcripts and surveys. I like that Nvivo is easy to learn/use and the data can be viewed in many different ways. I have heard coworkers complain about NVivo sometimes crashing or not saving their work. Because of this everyone using Nvivo is recommended to save two versions of their project; one in the shared drive and one on their private drive or desktop. Another minor complaint is sometimes extra text is pulled into the areas that I code. This can make viewing the data by node a little messy. Overall I would recommend NVivo for analyzing qualitative data. I have heard that my coworkers prefer another software, but I only have experience with NVivo. Coding qualitative interviews efficiently and objectively. Using nodes and running queries is helpful to organize and understand the data. "NVivo - Effective Tool for Qualitative Research "
NVivo was fairly easy to interface with in order to code lengthy interviews to uncover common themes. As several coders were each coding all of the interviews to attain a level of inter-rater reliability, NVivo also facilitated this process. It would have been helpful to be able to visualize what the other coders had created as categories while I was coding. Enhancing the ability to view this would have saved time and lots of additional meetings for revisions and consolidating the thematic codes. NVivo is a very helpful tool for qualitative research. It is fairly accessible and intuitive and does not require extensive training for research team members in order for them to join projects and participate in thematic coding. NVivo was used for a qualitative research study at a large research university. I really like the flexibility of program to accommodate different modalities and there have been improvements in the software to go with with my research needs. It helps me to see things differently in ways that I had not thought possible. Nvivo can be expensive and I've had a hard time convincing others to buy it to use in labs. It can also be hard to merge with other co-workers projects, particularly those who are working with Mac computers. The business problem it solves is how to keep different parts of the project together and view it differently in ways that I had not imagined before and is useful for poster presentations. As a graduate assistant, NVivo was very user friendly. I was assisting with multiple work-site sodium reduction programs in which I utilized NVIVO to transcribe and analyzed qualitative data to identify themes and attributes to include in data reports. It was easy to navigate the interface and provided adequate settings for additional information related to troubleshooting. Truthfully, there wasn't anything that I disliked about using this software. The software is user-friendly and doesn't require much troubleshooting. If there are issues, the software provides sufficient information to be able to navigate it. The University of Texas at San Antonio used the software to analyze qualitative data to articulate interviews and provide information to reduce sodium intake on work-site premises. 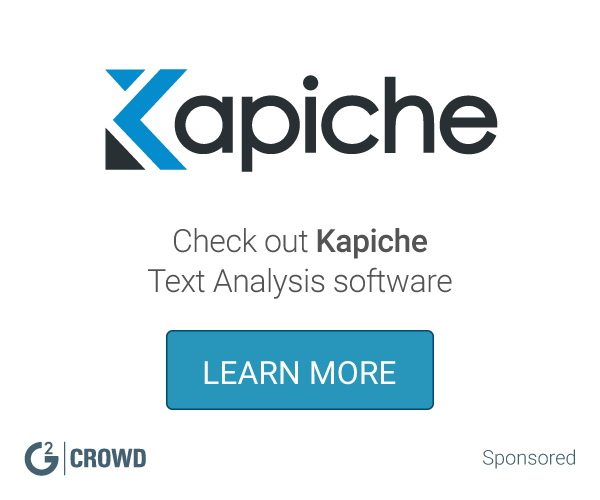 This is an excellent software for theme analysis and sentiment analysis in open-ended survey responses and interviews. The latest updates have improved the processes immensely. It would be nice if the software made it easier to run comparisons between the open-ended response items and the quantitative items in a survey. It's very easy to compare text responses across the dataset, but inter-item correlations are tricky to get to. Watch the tutorial videos and search for additional training on YouTube before beginning. Database setup (the spreadsheet file) is absolutely critical to getting the software to work effectively. I use nVivo for customer satisfaction survey data. It is great to work with, but takes a lot to get used to. "Works for Team Research Projects"
The multitude of features and options, the ability to adapt your NVivo experience and tailor it to what you need from the program to come to analysis you are looking for. Ability to have multiple people coding, with clear distinctions in who coded what portion, as well as the various ways to visualize your data, analysis, and coding. I also really like the AutoSave feature. The downside of my use of NVivo was how it did sometimes crash unexpectedly, resulting in a loss of work. Also, it was sometimes difficult for Mac and PC users to collaborate, due to the change in file formats, or, even it does work, it is not time effective. The program also has occasional glitches. If you are considering NVivo in your place of work, set up and require and provide detailed instructions and tutorials for all of those considering the product. This product is great for analysis and deeper qualitative studies, but does have a bit of a learning curve. Many features are extremely handy, useful, or just plain neat, but you will need to know how to find them. NVivo does have great keyboard shortcuts available, which I always made use of, which enabled me to work efficiently and productively. Ability to work on a research team, do large scale analysis, have a commonality in research meetings and clear procedure for finding what we want from our datasets. The benefits have numerable, it was essentially how we were able to complete our research and come up with a basis for a paper. "For qualitative analysis, NVivo is the best tool I've found." It's very user friendly and aside from being a great tool for qualitative analysis, it is also a great tool for LEARNING qualitative analysis. It's interface is very conducive to learning how to code textual data. In addition to aiding in the learning process, once learned, it was easy to use. It's a tool that helps quantitative data tell a more well-rounded story. I did not come across anything that I strongly disliked during my time using NVivo. I do recall having a bit of an issue with uploading another person's qualitative data/coding into my program for cross-analysis, but not a glaring enough problem to stand out to me now looking back. Great tool for qualitative analysis. Highly recommend in a research setting where qualitative data is of value. I used NVivo for global health research and it gave me insight to the context of my quantitative data. It really helps the data tell a story. It's easy to get started and to figure out the basics for a project. I appreciate how easy it is to develop nodes and to keep the data organized. I haven't used all of the features (e.g., importing images, videos), but it's a great way for me to analyze my interview data. It's hard to share projects with colleagues in different physical locations. Transferring files isn't easy. For example, I was working on a project with a colleague and we weren't able to figure out how to share NVivo files electronically. We contacted the help staff at NVivo and their advice wasn't helpful. We tried sharing the files through several cloud services, but we could not upload them successfully. I think if NVivo could figure out a way for collaborators (who work in different physical locations, on different networks) to share files this would make the project much better. I'm in academics. I use this program for my research. I do a lot of interview research and this program is helpful for me to manage my datasets, run reports on my data, visualize it, and so on. Eventually, I will use this program to teach my students how to conduct qualitative research. Even though I'm early in my career and have used this project sporadically, it's my favorite. "Very useful for qualitative research"
Good tool for organizing qualitative research. I used it for organizing notes from interviews and focus groups and was able to use it to inform survey questions and publishing results in a more quantifiable way. double checking of data is also possible, which is very handy if you are publishing your results. I can't say I had any problems with it. But I am not an advanced user so improvements are possible. If your company can pay for it, definitely get it if you do qualitative research but would like to organize your notes and thoughts in an easily verifiable way. I'm not sure if I would get it if it wasn't paid for by the company but i actually do not know how much it costs. Interview and focus groups information organization and publications. If you want to have it all in one place, this tool is very useful for these purposes. "Time consuming with great results!" I really like NVivo's easy to use interface, as well as its output. I think it is valuable to have a way to turn qualitative data into some sort of quantitative output so that is neat. I also like that you have control over what main ideas you put into groups, it's not automated. Setting up a project still is a little time consuming. Although the software uses key words and phrases to group, I've found I've had to still check all the comments for error in grouping, etc. Also I've had some trouble with crashing, but mostly when I started using it. NVivo allows us to take student and staff responses and turn them into number based ideas. We place a high value on qualitative data, but didn't really have a place or way to use it prior to NVivo software. Now, we can organize and utilize the data to make positive policy and program change. "Perfect for Qualitative Analysis Review"
I really love how user friendly NVivo is. It's easy to switch between Macs and Windows platforms. I love that I can import my codebooks and can easily code things quickly. The data visualization tools are also very easy to use. The only thing that can be frustrating with NVivo is sometimes when I am switching back and forth between .a Mac and a Windows that the files take much longer to load on a Mac. I switched to NVivo from Atlas.ti because it's faster and more affordable to use. My team and I are looking to use this software to quickly completely qualitative data analysis. I appreciate that the program takes the old-fashioned practice of sticky notes and highlighters for textual analysis and provides a modern version of this in a technologically-appropriate way (i.e. flagging and color coding thematic observations). I further appreciate the ability to import textual data rather than having to manually input it. The word count feature is unreliable for discerning themes within textual data--however, it may be improved if expanded to include phrase restriction in the search criteria options. I used this technology to work with Student Affairs data at a large, +30,000 student university. It helped to organize and manage large amounts of qualitative data. "Makes Research Easy - Just Ignore the Bells and Whistles"
For NVivo, I like how easy it is to keep all of my data together and searchable. I can run queries to find specific keywords and create charts of my data with ease. Changing my codebook and creating parent/child codes is simple and saves a ton of time. I dislike that I can't save my presets easily. When I create bar charts of my coded data, I always want to look at the number of occurrences versus percentiles. I have to change this setting manually for every code. I'd also like an easier way to exit the editing screen for my data. These really are nitpicks, but they're relatively annoying. Being able to keep my annotations, data, and coding in one place is superb. Being able to change my codebook and easily visualize my codes saves me so much time and energy. I really like being about to keep my sources organized for literature reviews. I can easily code and revisit sources when I begin writing. I would like to be able to import a list of words and have NVivo automatically search on those words. I suspect, though, that this function may not be the intended purpose of the product. It's easy to use. It has a very Windows-based GUI. Similar to Office Product, which made it easy to adapt to. I haven't discovered any unappealing limitations or issues. So far, so good. Organization, organization, organization. Not only has NVivo helped me with my literature reviews, it has also been a great tool for document and text-based analysis. "Easy to use. Intuitive design." NVivo is straight forward and intuitive. It's easy to train staff to use, which allows short term staff (e.g. graduate research assistants) to help with the coding workload. No real complaints. The program runs well and operates as expected. It would be interesting to see NVivo add some data visualization tools to the product. NVivo was straight forward and easy to use. It required little training to get up and running. Graduate research assistants had no trouble learning it on the fly. Anytime I have an opportunity to include transcripts or other qualitative data in my research, NVivo is my go to software program. I used NVivo to code interview transcripts from people at several sites across the US who were implement nutrition and physical activity programs. The data we received from these sites had great information, but was highly unstructured. Reviewing the transcripts in NVivo allowed us to identify patterns between the sites that would have otherwise been missed. NVivo gave us the tools to add context to our quantitative data and capture the changes going on at each site more completely. We were able to gain insight into some of the more nuanced changes that occur leading up to policy changes at the local and state levels. It was reliable in the sense that information was never lost. The ability to code information was uncomplicated without running the risk of being oversimplified and missing detail. I was never concerned that the software would ever lose data, which was a huge relief when storing so much important information. The system was slow moving, often took a long time to load information which slowed down work efficiency. The platform was not as intuitive as it maybe could have been. NVivo allowed for information to be stored all in one place. Streamlining the process of interview coding, transcribing, etc. all in one place. Benefits also included the ability to work on a team using NVivo it allowed for collaboration more readily. "NVivo in Diverse setting "
It is very user friendly and aesthetically pleasing. I find NVivo to be very intuitive and as a social scientist I have been able to get my clinical science colleagues to use NVivo. My favorite feature is the coding comparison which allows us to work as a team to collaboratively and accurately code text. Some of the logic is not clear - I struggle to find certain reports after I run them and save them. Please make a better set of help docs/sites. I have intermediate to advanced questions and your forums do not help. NVivo fills our void for text-based analysis and allows us to use our interview and focus group data for more sophisticated purposes. There's definitely a learning curve to NVivo and it's not as widely adopted as other software packages. NVivo allowed us to analyze thousands of survey comments that we would have to rely on several staff to do. The text analysis gave us clear themes to work with and give the marketing team direction for a new campaign. The ability to quickly pull specific codes was helpful in pulling quotes for manuscripts and data reports. It's a lot of front-end work that I wasn't convinced was worth the result. For the amount of money we paid for the subscription I didn't feel like the resulting utility of our code structure was radically different from when we used code in Microsoft Word or Excel. Also the inability for multiple users to code simultaneously was a bit painstaking to work around in comparison to Dedoose. NVivo has been useful as adding an air of credibility to our qualitative methodology in grant proposals and manuscripts, but honestly I have yet to realize it's full benefit during analysis. "NVivo allowed for my research team to effectively and efficiently conduct qualitative research." I like the Word Trees and word maps the most. I also utilized the word search querys. I wish there had been more of visual displays and applications to display the data. The word maps and tree was great but I'd like to see more visuals or charts with number representations. I was solving doing thematic content analysis on large sets of data, specifically interviews. NVivo creates an efficient and effective way to explore, observe, and describe qualitative data. It allowed my team to better organize the data which saved us so much time. "Nvivo user for public health evaluation in both governmental programs as well as academia." NVivo is very user friendly - without formal training in the software I was able to utilize NVivo's features to accurately enter, code, and evaluate my qualitative data. It was easy to import data, code it using multiple users, and analyze the results. A downside I found while using NVivo was that your methods of coding do have to be very similar - if one person codes a paragraph, but others just sentence, it can definitely have an impact on your percent agreement - best to sort out methods ahead of time. I used NVivo to analyze qualitative data from focus groups. It was quick to use and user friendly. It was easy to use and made qualitative research simple. I feel like there were features of NVivo that I was not utilizing because I did not know about them, and I could not find any training that NVivo offered. Use if you are interested in text analysis. It makes text analysis easy and can save you a lot of time. We used NVivo to conduct text searches for keywords. "Awkward at first but gets easier once you get the hang of it"
My favorite feature is the Word cloud for presenting qualitative data .Also, it is pretty easy to to create nodes and sub-nodes. I have not used the analytic part yet, so the jury is out on that. Nvivo icons to execute commands to code interview transcripts are not immediately intuitive. Also, I wish there was a quicker way for assigning interview text to node/sub-node categories. NLP is just not very good. If you can, you should get transcription services. Text Analysis feature is pretty good. NLP feature needs more work. In healthcare research, we use to manage, code and analyze qualitative data such as interview transcripts. "I do not have much experience using NVIVO"
"Used this at university- will continue using for my own projects"
It's great for coding and running queries. It's relatively straightforward to use and is easy to pick up. The plugin for switching files from Mac to PC on a team is very finicky. Have your team work solely on Mac or PC. Switching between systems is difficult. We're using it for a qualitative and quantitative evaluation of the Ronald McDonald house in New Orleans. "A good tool for qualitative analysis but needs to have more collaboration features"
That there is no collaboration feature, that you have to merge files manually from different file systems to get a real analysis. "Excellent product for qualitative data"
When you input data it can show you the frequency of different words, and create a word cloud to visualize that frequency level. I recently found this really helpful on a project we were conducting. I didn't bother with any of the tutorials, and just jumped right in. It wasn't as intuitive as I would have liked, and spent more time on trial and error. Give this software a try, you'll be happy with the new ways it helps you explore your qualitative data. I used it to take a qualitative data set from a large group of our employees and see what the trends were, and develop a "why" statement for our department. The software was relatively easy to access and navigate. It could be slow at times. This may have been a result of the hardware that I had access to at the time, but it slowed down the process to a standstill sometimes. It was used in a research setting to analyze large amounts of confidential documents. The benefits were largely realized. "Used NVivo at work to sort phrases into distinct categories"
I liked how easy it was to use and if you made a mistake you could easily go back. I used this software when the nodes, etc. were set up for me, did not work at creating the nodes. I am using it to do quantitative and qualitative analysis on home health admissions processes. the data is still being analyzed. 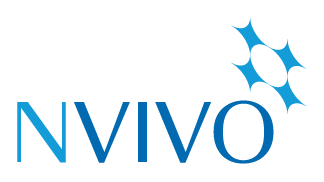 "NVivo is a great software "
Do the tutorials before starting to use it they are very helpful. I use it in research to code my data from interviews or surveys. It makes summarizing large amounts of information very easy and helps me figure out key themes. Dr. Melvin J. Rivers D.
"A Qualitative Study Using A Qualitatively Quantified Analysi"
I asked the right questions to get to the root cause of problems in an organization. Envivo is a great tool to gather information and discover the emerging themes which come from that information. "It was a very useful tool to analyze qualitative data." I like that you could compare multiple transcripts at the same time. It was super useful for analyzing qualitative data. I also like that you could highlight certain quotes from different transcripts and oragnize them into the sections of the outline of the report. There was not really anything that I dislike about the product. I dont recall there being real training to our team from NVIVO. But my learning and Development team created a basic training. We are solving our clients problems and providing them the data to make strategic decisions. "I used NVIVO while in school to analyse data. " NVIVO was really simple to use and unlike other programs I used to use it doesnt crash in the middle of using it. NVIVO helped me quickly analyse data I collected for a school project and determine any patterns/ understand the data. The color coding feature. The fact that you can attribute colors to certain codes is great. The visual display of all passages coded. At first I was a bit overwhelmed by the way the codes were displayed. I thought that they could be presented in a clearer and more visually appealing format. So you can easily distinguish between different coded passages. I specifically like the team functionality. I work a lot with other researchers and RA and being able to code together is a tremendous advantage. "Nvivo is an efficient tool for coding and analyzing research data." I used Nvivo for analyzing my research data. I had 16 semi-structured interviews which I transcribed and coded using the program. I liked the color-coding aspects of the text analysis. There was a bit of a learning curve and some of the features were not intuitive. I did not receive much training. Better access to training resources would be great. I was doing academic research. Coming up with root cause analysis for certain behaviors in my field of study. The benefits were general and useful in determining future policy. The user interface was a little clunky and it sometimes took to many clicks to get somewhere. It could use some streamlining. So far I have had a great experience. This product has provided a lot of time savings for me. Great for qualitative data analysis. This product has saved me a lot of time. "Easy to Code, Hard to Analyze"
It is easy to code text or images. It is intuitive to get started coding. Once coding is complete, it is very difficult to produce and examine quantitative descriptive stats on the codes applied. I have used NVivo for qualitative coding for research projects in the past, but have now switched ti Atlas.ti, which has greater functionality for my purposes. "Efficient for qualitative data "
The ability to create themes across many resources by tagging, such as interviews and articles. I think there should be something a bit better than the word cloud to consolidate all the themes that were selected. Sorting through large qualitative datasets can be very time consuming. NVivo helps me categorize this information and turn qualitative data into something more quantifiable, such as how many times a certain theme or sentiment came up, which helps me capture trends. "Small Learning Curve, Great Tool"
NVivo provides a great way to easily organize themes in qualitative data, such as interview transcripts. Can create many different categories and add snippets of text to them. NVivo is a little difficult to get used to as a first-time user. It's a great tool that stands in a unique gap, and you'll be glad you tried it. NVivo is awesome for analyzing common themes in qualitative data, allowing you to compare trends across data-gathering sessions. It's very seamless and quite stable (e.g. does not lag, and barely any hiccups in the program). I know they provide site licenses which make it much cheaper than having to purchase individual licenses. I love how interactive this service is, and how interchangeable the data is with other software. It makes it so easy to share info in a user-friendly way to laymen. There are only a few glitches and confusing items that make the learning curve for this software a bit higher. I am able to share information on performance and attendance far easier now that I am able to utilize this software in accordance with others. * We monitor all NVivo reviews to prevent fraudulent reviews and keep review quality high. We do not post reviews by company employees or direct competitors. Validated reviews require the user to submit a screenshot of the product containing their user ID, in order to verify a user is an actual user of the product. Hi there! Are you looking to implement a solution like NVivo?